Cyclone Marcus ripped through Darwin in March, felling more than 10,000 trees across the city. The landscape changed dramatically and the loss of shade and greenery, and homes for animals, had a devastating impact on the community. The Darwin council is now in the process of replanting so the city can return to its lush former self. It’s an enormous undertaking, and the council is calling for those who were affected by the loss of trees to reach out to be part of the important rebuilding process. At three community tree planting days in December more than 100 trees are to be given new life across the city suburbs. Parks and reserves coordinator Natalie Dreibergs says everyone is invited to come down and learn more about their local parks. “We want to engage the community and inform them of best practices in planting,” she says. 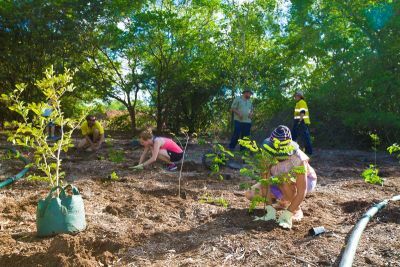 “The community planting days are to help replant the local plants and learn about the best practices for cyclone resilient trees.